By Tanja Bezjak on 10. April 2018. As Google Chrome went one step further in improving users’ experience by introducing strict guidelines, banners must adhere to if they want to become acceptable ads. In other words, if they don’t want to be blocked. We were quick to respond, creating 5 (five!) new Chrome-approved ad formats to show your audience. Always aiming to bring innovation to our clients and partners, we have enriched AdCumulus’ Ad Server with a whole new set of mobile ad banners inspired by the latest digital advertising trends, search engine regulations and innovations. If you’re a brand or an advertiser, meet a safe new way of communicating your products. Publishers, these will grow your numbers. 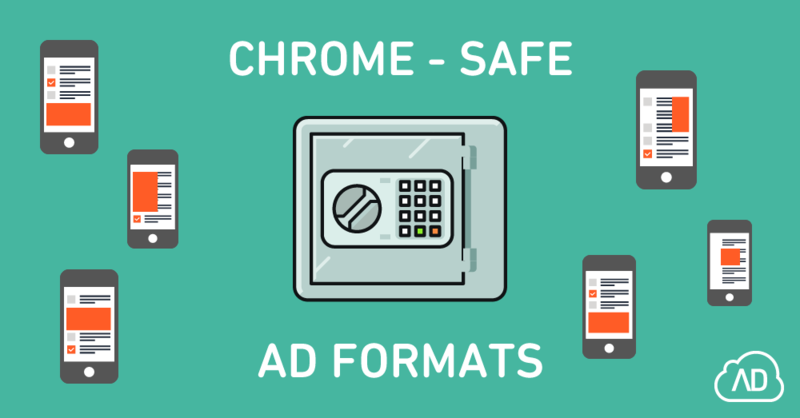 AdCumulus proudly presents five new Chrome-safe mobile banner ad formats, one by one and with demo video examples! Can you imagine a banner that doesn’t pop up or appear within a text? How about a regular image in the text being framed with a promotional message? Yes, now we are talking! If your media brief is focused enough, this banner can even match the context of the content being read and you have a win-win impression of your banner. Similar to the In-Image Frame, this format goes straight to the point, covering the whole image as it appears. Since the banner is HTML5, it can also include a short animation. However, at one point, the banner collapses into smaller dimensions covering only a part of the image, but still remains visible. Short and simple – this is an animated banner that appears over the image. Please note that this format doesn’t cover the whole image but just a part of it. This banner format appears as the frame of the entire mobile screen. Meanwhile, the user can still touch and scroll the content inside the frame. After a short animation appears inside the frame, the banner decreases to the bottom of the screen. If you thought this was a bigger version of the “In-Image Frame” format, wait a second – this one expands! Once the banner shrinks to the bottom of the screen, it allows the user to expand it, but this time covering the whole screen. You can fit three different creatives in this format, increasing your chance to engage with the viewer. Grab the attention of users “on-the-scroll”! This banner initially appears in the text, but with every scroll the visual on the banner changes so that a quick message can be delivered while the user is scrolling through the content. The banner supports a maximum of 3 images due to its nature of appearance. The three types of “In-Image” ads show up inside of the image originally posted on the article and support HTML5 animation. Together with the “In-Screen”, they have one common characteristic – responsiveness. This means they adapt to the size of the image of appearance. How cool is that! Finally, the scroll banner is perfect for delivering short and catchy promo messages. But are they really acceptable ads? To recap the answer to the almighty question “Are these new banner formats Chrome-safe?” Of course they are. Our traffic team worked night shifts to do double checks, so with black circles around their eyes they assure you that you have 0 things to worry about with our new banner formats. So now we can add Chrome-safe banner formats to the list of reasons our clients love working with us! If you haven’t yet found a partner with an ad server that responds to all your ad-server-dreams and fantasies, try our product’s demo and be amazed. It’s totally free and no-strings-attached!